Late Preclassic to the Protoclassic Period in Colima, West Mexico, circa 300 B.C. to A.D. 250. 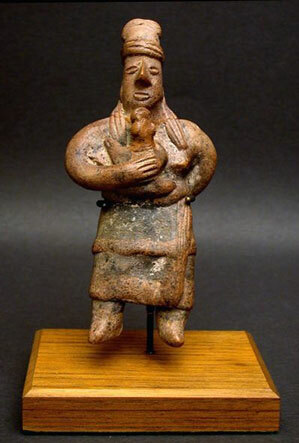 This conjoined Colima ceramic figural maternity group depicts a standing woman protectively holding a small child to her chest with her right hand. The left hand reaches around to her backside to secure a second small child who clutches her shoulders with both hands. The mother, with ‘coffee bean’ eyes and mouth, well-modeled nose, incised appliquéd headgear, earring, and tresses of hair falling to her breasts, is wearing a tiered skirt decorated with an incised sash and pigmented with remains of black and reddish brown on buff; the child on her back, with well defined eyes and hair, has remains of white pigment upon the face. Conjoined ‘flat figures’ are very uncommon. A woman carrying two children is quite rare. These general maternity types are often thought of by some scholars as fertility symbols in shamanistic rituals for women wishing children, particularly ones with several children. Provenance: Acquired in the 1960s for a Los Angeles South Bay area collection. Condition: The head of the woman and the front side child have been reattached. This conjoined figure is otherwise in fine condition. This figure is firmly but delicately secured to a custom teak stand by a metal brace.